Salmon is a favorite around our house, and I continue to try to come up with inventive ways to serve it. Recently, I’ve been making this salmon with mango salsa and our family has loved it so much, I knew I had to share it here! One of the top questions I get asked by desperate mamas hoping to make healthier changes for their family is “How do I get my kids to eat healthy food?” My answer is simple: you make it for them. And though it really is just as simple as that, the task of making healthy food for your kids isn’t quite so simple. First of all: what is even healthy?! And what if it’s a far cry from what your kids are eating right now? Listen, I’ve been there. Don’t cover your head in shame as you take a mental inventory of the frozen chicken nuggets in your freezer and boxes of pasta in the pantry. Those were once staples in my kitchen, and rest assured my kids now eat food like this salmon with mango salsa. And they love it! So how did I get from standard American diet to nourishing, paleo-style foods? I just went for it! Here’s the honest truth: when I got married at 18, I couldn’t even make a box of mac n cheese without messing it up. I always overcooked the noodles. And try as I may, I bombed every cookie recipe I tried meticulously to follow. Cooking did not come easy to me. So when I had kids, I looked for the easiest route to feed them too. Enter frozen and canned foods and processed jarred sausage-like meats. I gag a little now thinking of what I fed my precious babes in those early years. When I knew I needed to make changes for our health, I was determined to learn how to cook, and to cook food my family would actually enjoy. 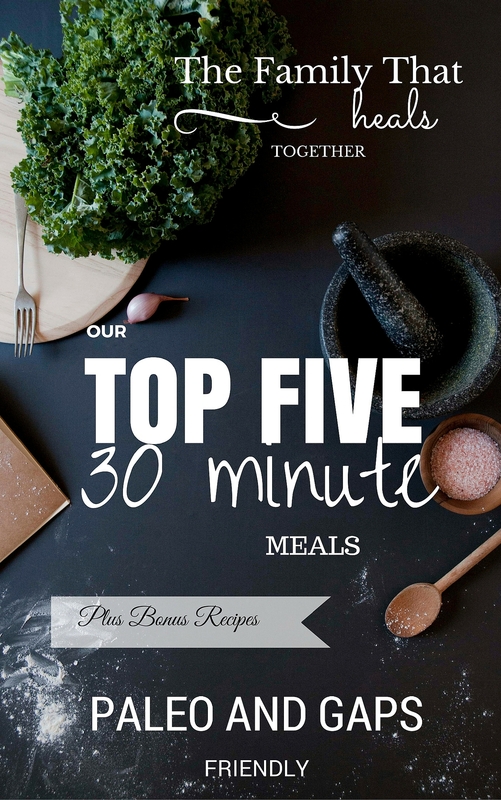 I “healthified” our favorites, Jaclyn-style. If I hadn’t continued making the foods we loved, but in healthier ways, I don’t know if any of us could’ve made the transition. At first, it was making homemade breads, tortillas, and treats with whole wheat flour and less processed sugar, but eventually, I learned to make grain-free, paleo-style versions of our favorites like biscuits, tortillas, chicken nuggets, and even sugar cookies. This ensured that my children ate the healthy foods I put in front of them. I stopped buying junk. As moms and grocery getters, we have a lot of power over what our kids eat. If there isn’t junk food in the house, the KIDS CAN’T EAT IT! It’s a no-brainer. I was persistent. When flops did happen (and they still do! ), I kept trying my hand at new and yummy recipes. A few failed paleo recipes didn’t mean it wasn’t worth pursuing this new way of cooking, it simply meant I needed some really great cookbooks and a little determination. I got creative. Listen, when I first began cooking at a young newlywed, I didn’t even use salt and pepper. True story. Mr. Incredible still salts and peppers everything that comes out of my kitchen because I scarred him in those early days with tasteless, bland food. These days, I’m not afraid to get a little creative with flavors so that things stay interesting in the kitchen, and I encourage my kids to try new things and expand their palettes. 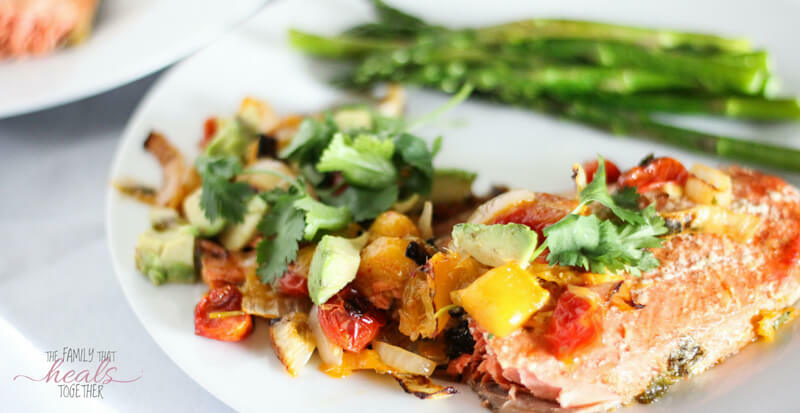 That’s why I love this salmon with mango salsa so much- and so do my kids! I really used to hate fish, but once I began getting creative, I realized that salmon held so many possibilities. 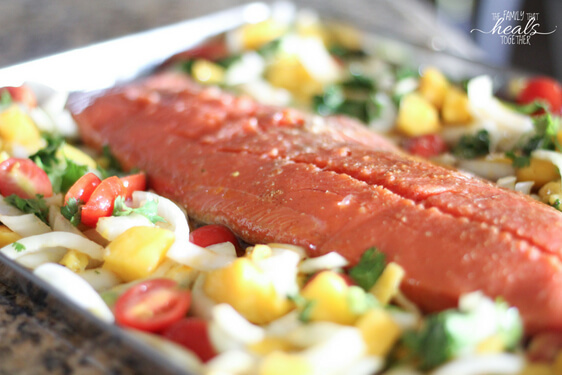 Not only do I love a simple oven roasted salmon, but I adore adding fresh flavors like mango and spices with a Latin flare. 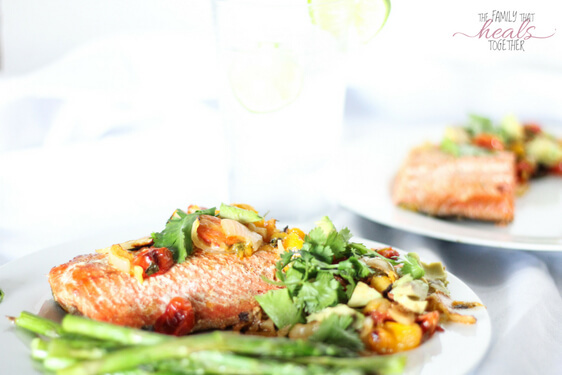 Combining salmon with the fresh flavors of mango salsa and spices like chili powder and cumin puts a unique spin on dinner! I kept this recipe mild because my kids and I don’t really like spicy foods, but you could easily add a diced jalapeno and some cayenne to turn up the heat. Find the recipe below. Combine avocado oil, lime juice, cumin, chili powder, salt, and garlic powder in a large ziploc baggie. Mix around a bit, then add the salmon. Seal and place in refrigerator for 2-4 hours to marinate. 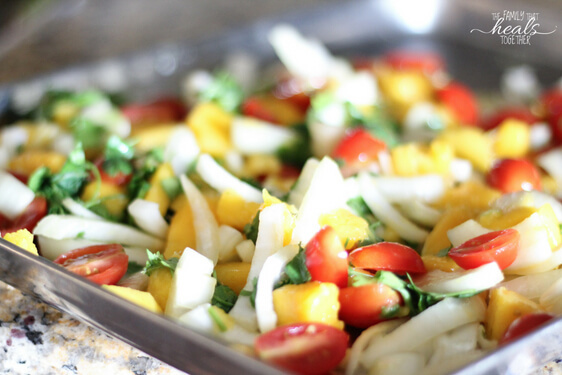 Preheat oven to 425, then place chopped mango, cherry tomatoes, onion, and 3/4 cup cilantro on a large baking sheet. Stir to combine, then leave a space in the middle of the pan. Move salmon to the baking sheet, in the middle of the vegetables, then pour the remaining marinade over the vegetables. Roast for 15 minutes, stir vegetables, then roast for 15 minutes longer. Turn oven to broil to finish the last 5-10 minutes and crisp up the vegetables. Keep a close eye on them and stir every few minutes. If you'd like to spice this recipe up, add cayenne powder to the marinade, and dice up a jalapeno or two and add to the vegetable mixture before roasting.